Thank you for visiting our Bulldog Gifts page. We trust that you will find unique gifts items for the English Bulldog lover in your life. All of our Bulldog potter is handmade for you, here in our Northern California studio, and are made with joy and care. 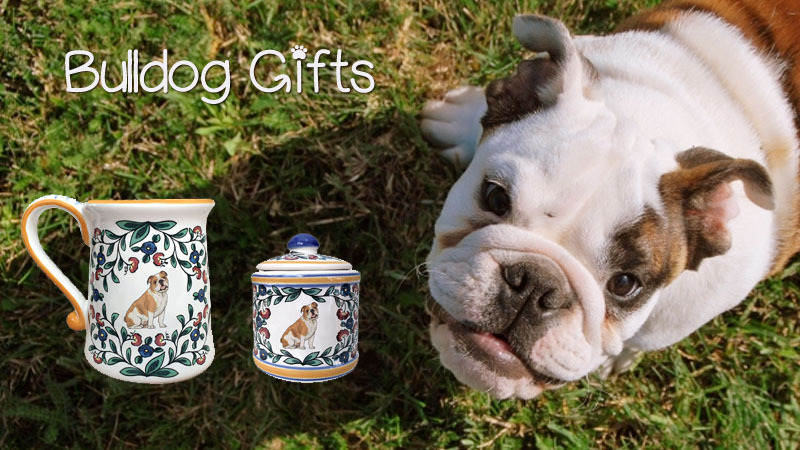 We offer a selection of Bulldog Merchandise including Bulldog mugs, dipping bowls, wine stoppers, treat jars and more. You can choose from the standard Bulldog coat or you may have your Bulldog merchandise customized with your dog’s colors and markings. Simply use the “custom” option in the drop down menu on the item page and upload a profile picture of your dog and we will do our best to represent his or her coat. Our stoneware pottery is decorated in a Mediterranean style, with the cute Bulldog design in the center, surrounded by a colorful floral pattern, and accented with cobalt blue and golden yellow hand painting. This combination of elements is sure to bring a smile to your face. While our items may look like they require special handling, they are made for easy care and are dishwasher and microwave safe. Also, our Bulldog gifts are made with non-toxic and food safe materials for your peace of mind. The English Bulldog is one of the most popular breeds in the US, and is ranked #1 in LA (along with the French Bulldog). At least 39 colleges, and close to 1000 high schools have the Bulldog as their mascot. What makes this wrinkly faced dog such a popular friend? Well, the wrinkly face for one. Don’t you just want to kiss it? Plus, Bulldog’s are very agreeable and laid back, maybe verging on stubborn (the ultimate in laid-back). But they make great companions for busy families and those living in apartments or condos, because this breed doesn’t need much exercise, and would prefer to lounge. We are glad to celebrate this personable breed with our handmade Bulldog gifts.